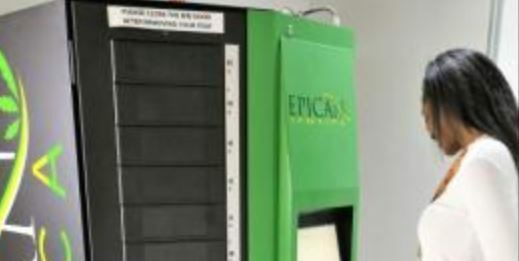 A Jamaican cannabis company, EPICAN, intends to launch machines that will dispense medicinal cannabis, local news reports say. According to the reports, the machines will operate in much the same way as traditional candy or drink-vending machines. The Gleaner said they will be available at select locations as soon as EPICAN gets the necessary approval from the Cannabis Licensing Authority (CLA). While these cannabis dispensing machines will offer the convenience and choice selection as a drink-vending machine, the built-in security features will be a marked difference and will showcase the high technology being introduced by EPICAN, the newspaper disclosed. It said one such machine is on display at the retail store in Market Place, Constant Spring Road, St Andrew, awaiting roll-out. EPICAN’s chief executive officer Karibe McKenzie explained to the publication that the technology behind its design took into account, and addressed, the potential risk of abuse. “We wouldn’t want a situation where a kid could steal their parents’ card and come to the machine and access it,” The Gleaner quoted McKenzie as saying. To prevent this, after receiving the necessary guidance and clearance from a doctor to use medical cannabis, patients may register with EPICAN to join the members’ club, for which a card is issued. However, they must submit a thumbprint as part of the registration process. Each time they use the machine, the card as well as the thumb-print must be submitted in combination for the purchase to go through. “So you can’t lend it to your friend to buy for you. Won’t work, and this is because we have to ensure that anyone we sell to is registered to use cannabis or cannabis-derived products. So it is consistent with our efforts to meet as well as exceed government’s compliance requirements,” McKenzie asserted.